What does it mean that 42 percent of Americans don't want Congress to raise the debt ceiling? Despite that nasty game of chicken going on in Washington over raising the debt ceiling, congressional leaders from both parties have agreed that doing it is necessary. 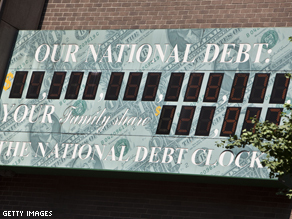 National debt exceeds $14.3 trillion as the government faces an August 2 deadline to get congressional leaders to agree to a deal. The argument is over what else goes into a such bill that's tying them up and bringing us dangerously close to defaulting on some of our loans. But according to a new Gallup poll, 42% of Americans don't want the debt ceiling raised and want their members of Congress to vote against any measure that raises it. Only 22 percent want their lawmakers to vote for raising the debt ceiling. One third of Americans say they are unsure. When asked which is a greater concern, 51% say raising the debt ceiling without plans for major spending cuts worries them more. Only about 1/3 say they are more concerned with the risk of a major economic crisis if Congress does not take action. But there are two separate issues here. Republican lawmakers have tied voting to raise the debt ceiling to long term deficit reduction. The fact is, if we don't raise the ceiling by August 2 and the U.S. defaults on some of its loans... interest rates would shoot up, the dollar would plummet, stock markets around the world would tumble. If you think things are ugly now, they could get much uglier. In a separate poll, the number of Americans who believe the country is on the wrong track rose to 63% this month, up three percentage points from June. And if the United States fails to pay its creditors, it's a good bet that number will go even higher. Here’s my question to you: What does it mean that 42 percent of Americans don't want Congress to raise the debt ceiling? It means that most of the taxpayers in this country have to live on a budget, and our government needs to start doing that. We can't continue doing everything we do with borrowed money. It doesn't matter if it's wars, defense spending, or even some of the entitlements. I will agree that taxes should go up a little bit, but it has to be fair to everyone. Americans see the present danger of outrageous debt and foresee the dire consequences of more debt further piled on. President Obama's requests for more debt would be like asking the captain of the Titanic to hit another iceberg. It means that Americans realize that we can't keep borrowing $0.40 of every dollar our government spends. But a similar majority do not want any cuts to the programs that benefit them like Social Security and Medicare. Like AP reporter Charles Babington wrote, "Voters generally oppose large deficits, higher taxes and cuts in programs that benefit them - a painless but impossible combination." It means the citizens think Obama has squandered far too much of our money, at a time when we can ill afford it, and we are all fed up with that! Americans see this as the definition of our debt problems. If the debt limit is raised, it seems counter-productive in the crusade to lower the deficit. Now is viewed as the best time to start a process by which this debt can be made manageable. America needs this to happen before the limit can be raised. It means that once and for all average Americans are sick and tired of lunatic federal government. runaway spending, the deceit covering up where all the billions actually go, and the mindless casual attitude of how horribly this will affect our children, and beyond. Thank God for a few leaders with a backbone!! Enough!!! It means they hate congress. It means that most of Americans are uninformed. The bills have already been run up . . . this isn't for new spending. During the Bush years there were 2 wars, tax cuts and Medicare Part D put on the credit card with the promise to pay in 2011. The bill is now due. American's see the present danger of outrageous debt and forsee the dire consequences of more debt further piled on. President Obama's requests for more debt would be like asking the captain of the Titanic to hit another ice berg. Hopefully it means that Americans are no longer falling for the nonsense coming from Washington, and will realize that they have to demand fiscal sanity from our elected officials. Ron Paul has already proposed a simple way to avoid default, but, of course, the media doesn't want to discuss that. Perhaps people are also catching on to the fact that our government has defaulted in the past when it took us off the gold standard – so that they could spend by increasing credit – and now by devaluing our paper currency. Trying to scare citizens by suggesting that SS checks may stop is another sign that politicians are basically deceitful. Where is the statement that we won't be able to continue all of these wars? Have we now come to the point where wars are more important than senior citizens? I think that many people believe raising the debt ceiling is the same as saying it is OK to keep spending more money. Journalists are scrambling to note that this is about paying the bills for debts already incurred. If everyone understood the implications of defaulting on debts they would agree that it has to be done but they still would not like it. It means that most of the taxpayers in this country have to live on a budget, and our government needs to start doing that. We can't continue doing everything we do with borrowed money, doesn't matter if it wars, defense spending, or even some of the entitlements. I will agree that taxes should go up a little bit, but it has to be fair to everyone, we can't continue letting people get tax refunds but not pay taxes, how does that help. I must agree with some that the "Fair Tax", is probally the way to go. It only means that the majority of those have no understanding of the debt ceiling. It is all part of the dumbing down of America. It means most Americans don't understand what's going on. If you don't pay your mortgage, you lose your house, but if you're a nation and don't pay your debts, you lose your country. It means that the majority are watching the F network and listening to people like Bachman and Rand Paul. They really don't understand the ramifications of not paying our bills. American's have been loosing their jobs,budgeting and are concerned for their future. They would like Congress to stop the uncontrolled spending and focus on the future of the America. Congress seems to more concerned about their future and not America's. It means that they don't understand the situation. If we default, it will add billions to the debt in interest. First, It means that Jack has gotten his information from an unreliable statistics. Second, it means that they do not want me to receive my social security check. Third, it means that we the people need to propose a constitutional admendment to cease paying congress their free checks for no work when they stop my social security check, theirs should stop first. Those stupid people that want this must not receive any kind of social security. I earned this money, it is mine, and I dare anyone to mess with my earnings. It means that congress must find a way to not raise the debt ceiling. Americans see this as the definition of our debt problems. If the debt limit is raised, it seems counter-productive in the crusade to lower the deficit. Now is viewed as the best time to start a process by which this debt can be made manageable. America needs this to happen before the limit can be raised. Now if only we could agree on what this process would do. I think it shows that the American public doesn't really have a clue as to what that really means. Yes, we've had the government shut down a couple of times, and nothing seemed to be the worst because of it. But this is something entirely different. If it is similar, I will be quit surprised. It means that once and for all average Americans are sick and tired of lunatic federal gov't. runaway spending, the deceit covering up where all the billions actually go, and the mindless casual attitude of how horribly this will affect our children, and beyond. Thank God for a few leaders with a backbone !! It means the media has not done its job explaining the issue. The debt is a result of previous appropriations and tax cuts. If the politicians were opposed to the resulting debt, they should not have voted for those expenditures and tax cuts in the first place. What we're seeing now is just political theater. It says that a majority of Americans don't understand the realities of the national debt and its 'ceiling' ...or... the ramifications of defaulting on our obligations if we fail to raise it. Not raising the debt ceiling now, for whatever reason is like a farmer refusing to borrow more money to harvest his crops in the fall because he spent too much money planting them in the spring. I means that they haven't experienced the loss of some function of government yet. It means granny hasn't had to pay out of pocket for medication that keeps her alive. It means those of us on social security hasn't missed that check yet. And it means, who cares about all this stuff when our intelligent lovely ladies are going to the World Cup Finals after yet another dogged, determined match winning over a talented French squad that played magnificently except for three minutes in which we scored three goals Really Jack we both need to get a life. It means that once again, our elected officials are not listening to the people. 150 million Americans have either written or called their Representatives to say, "Don't raise the debt ceiling"!? I don't believe it. I do believe that many Americans don't have a clue as to how we arrived to this place in time, or how the country runs. Who is controlling our country right now are two narcissistic brothers and a "network" boss who is out-of-control and, who's "empire' is about to crumble. But, those two aforementioned brothers will pick up the pieces that Rupert is about to lose. Gotta keep the kool aid flowing. This past election has proven that the vast majority of the Rust-belt voters are a bunch of sheep!! Boehner, Kantor, Pense, McConnell where are the jobs!! Jack what planet are you taking your poll????????????????? It means they don't understand that the debt ceiling is for debts we have already incurred, and that failing to raise it will lead to a double dip recession at best and no Social Security checks or soldier pay at worst. Jack, it means that Americans are fed up with both the President and the Congress. No one seems to care about the big picture. We are sick of excessive spending, multiple wars, the insolence of the D.C. crowd, and the lack of empathy for we, the people. When does it stop! I am retired and do support a mix of spending cuts in most areas and also tax hikes. Cuts should be in some areas of defense and entitlements. Tax revenue can be increased by eliminating most deductions and loopholes for both individuals and businesses. this should include rate hikes and raising the taxes for SS and Medicare and reducining deductions for Mortgage and charity over certain income levels. Most if not all business subsidies should be ended and if over time revenues increase then possible lower tax rates in the future. a combination of both revenue increases and spending cuts. One good start to spending cuts for me would be to scrap the US Senate since this body doesn't seem to be able to accomplish anything unless 60 of them are in favor of it. What ever happened to a simple majority????? It means the majority of Americans don't understand the problem. Once they realize that not raising the debt ceiling means America would default on it's debts and cause a world wide financial crisis that would impact every one of us negatively for a long time, they will agree that the debt ceiling must be raised. Tying the raising of the debt ceiling to spending and tax issues is a Republican strategy that will back fire once Americans understand the issues are separate and should remain so. Did congress tie spending and taxation issues to the debt ceiling during the Bush administration when spending for 2 wars was at risk? No. Cheney said "deficits don't matter" and the Bush administration continued to spend and ratchet up the debt. Not only did they ratchet up the debt, they implemented a tax reduction for everyone but especially the wealthy creating less revenue. We have a mess because of a Republican Administration that started with a budget surplus and ended with a financial crisis. The Republicans need to be reminded of that and work with our president to resolve this issue. It means that most average Americans have a grasp on reality. Unlike Congress who feel spending beyond one's means has become the accepted norm. After all, its not their money so who cares? It probably means Americans are tired of watching our so called representatives ruining OUR country. Does anybody care anymore about the mess were leaving our children. Explain something to me Jack, with our financial situation in the news every day, who is stupid enough to loan us any more money when theres very little chance that we'll be able to pay it back. Doesn't anybody see the big picture? The world is full of terrorist that are just eating this stuff up, a couple more years and we'll be right where they want us, broke and unable protect ourselves. Isn't that why we have armed forces, to protect ourselves? They don't understand or pay attention to the ramifications of not raising the debt limit. Without a debt limit America shuts down. entitlements, the military, veterans, government workers, will not be paid. That is billions of dollars the marketplace won't receive. The last time I looked those mentioned, spend in the marketplace. That means the majority of American's employed who don't want Congress to raise the national debt ceiling may end up unemployed. You may not like it, but we all like to eat. It means that the national debt ceiling has been equated to runaway government spending by the majority of Americans. It is wrong to lump the two together. We need to modify government spending, eliminate tax incentives for highly profitable corporations and raise taxes among the wealthiest. The debt ceiling must be raised to meet our obligations and remain in good standing with the rest of the world and the American people. Your question answers itself! Most of us are simply tired of the Federal Government's spending and do NOT want the debt ceiling raised. Keeping it in place is at least one indirect way of having a balanced budget requirement. Most States and city governments have such a law in place. My god, when will these children quit spending our money like it was easily earned. Fire the 100,000 federal workers Obama has hired since he has been in office, fire the 33 Czars, eliminate the Dept. of Energy and EPA, quit taking frivolous trips and sending $300 to South Sudan to help them establish a new government. With those actions, we would have enough income to meet expenses. It means that Americans realize that we can't keep borrowing 40 cents of every dollar our government spends. But a similar majority do not want any cuts to the programs that benefit them like Social Security and Medicare. Like AP reporter Charles Babington wrote, "Voters generally oppose large deficits, higher taxes and cuts in programs that benefit them - a painless but impossible combination." It mean that that majority, despite all their years, do not realize money is needed to fund all aspects of government, that means taxes. I understand why the wealthy 1% vote for republicans, what is baffling is why the other 99% vote republican? It would appear the republican education system is working. it does not mean a thing that a majority of Americans don't want Congress to raise the national debt ceiling? they are going to do it anyways. what really matter is what are we going to do to the politicians when they do? voting them out is one thing but they don't care about that either. this country is so messed up. Jack it means that we are idiots for putting the same people in congress over and over. It means if people believe the right wing fringe (yeah tea party "patriots," and your ultra rich corporate backers who would destroy us in the name of the almighty dollar, I'm talking about you) that certainly dispels the myth, once and for all, that media has a "liberal bias." What happens to us, ultimately, when lies become truths? It means it's time to get spending under control. The credit card is maxed and now time for the shop- a- hollics in Demacratic Congress to slow down. Like a bunch of Drunk sailors? Balance , Cap and Cut. to at least show the Country you have any idea of what's going on . Run our money like a business ? Not to pay back constituents for there one sided agenda? It means that President Obama and Democrats in congress have done an incredibly poor job of communicating how disastrous the consequences would be if we don't. The Republicans have been very successful convincing the American public that their distortions of the facts are in fact the truth. After bringing the country to the brink of economic collapse, after turning budget surpluses into monstrous budget deficits, after nearly doubling the national debt, after engineering the greatest transfer of wealth from the majority of citizens to the wealthy minority and after raising the debt ceiling 5 or 6 times in the 8 years George W Bush was president the Republicans have the audacity to not only oppose common sense and equitable tax policy but they lie through their teeth in the process. Republicans are willing to risk further economic calamity for the sole purpose of making sure the wealthy minority and big corporations are able to keep hold of the unwarranted and unjustifiable tax benefits they and George W bush gave them at the expense of them vast majority of Americans. Do any of these folks have a conscience? There are many issues on which Republicans have valid points of contention with President Obama and the Democrats in congress but their record clearly shows that economic and tax policy should not be among them. Mitch McConnell made a comment today about not wanting Republicans to co own a bad economy. Are you kidding me? They have huge gigantic ownership of our current economic mess and seem willing to cause great hardship to the country solely for political gain. for not raising taxes to the voters, i don't recall voting on this. to the rich average 14-18%. Most Americans agree Obama is out of control, spends too much. The debt ceiling cap was raised 18 times under Reagan, the average increase was $0.072 trillion (that's 72 thousand million dollars). Obama wants $2.4 trillion (that's 2 million 400 thousand million dollars) in one raise. That's about as much as Reagan would have spent if he had served for 16 years, receiving 36 raises. Congress has to raise the debt ceiling so they can get paid. Don't forget – they'r fiddling with their own wages. The snowball effect of government checks coming abruptly to an end is staggering. By August 3rd taxes should be raised for 2 years and budget cuts should disrupt lives as gently as possible. If Congress fails to raise the debt ceiling those who voted no should be considered derelict in their job performance and fired. The majority of Americans who are against raising the debt ceiling do not understand the chaos that would bring. How can you ask that assinine question? I and my family were not included in the poll. If we have to hold our noses and allocate enough money to pay for Bush's UNFUNDED WARS, then that's what we have to do. The debt ceiling is up because there was NO WAR Tax and nothing dropped in order to pay for the UNFUNDED tax cuts the Shrub "gave us". I think the majority of the people in this country think the debt ceiling means more money to spend on future things. IT IS NOT. It's like making payments on things CHARGED. Maybe YOU can tell the uneducated. Clear it up, Jack. It won't be sensational, but it might just calm things down. Oh wait - that's not good for ratings. If Congress doesn't get this passed and social security checks don't get out on the 3rd. Egypt's uprising will look like a neighborhood BBQ. I am on SS and so is my dad neither of us has a back up anymore after the last two years. I guess I'll have to call my Congressman to send me a bag of kibble for my dog. Thanks Jack, watch you all the time. Ignorance is bliss until the stock market crashes again, interest rates go sky high and we are in worse shape then ever. Maybe some of that majority should listen to something other then Fox News and Limbaugh. Jack, that's gotta be the same majority that elected Barack Obama President. The old adage "You can fool some of the people some of the time, but not all of the people all of the time." seems appropriate here. The majority you are referring to needs to take their head out of the sand and realize if America defaults on its financial obligations the whole country's going in the toilet. But, to directly answer you question, it means that a majority of Americans do not understand economics. I truly believe that the majority of Americans feel strongly that basic government should continue.To stop paying Social Security, Disablity, and Military would be extremely cruel and unwarranted. It is way past time for both parties to honestly look at themselves and how their personal deeds and greed brought the great USA down to its knees. It means that the majority of Americans are misinformed, which also means, sadly for you guys at CNN, that the majority of Americans must be watching FOX News. It means most people do not know what they are talking about. I bet most people do not know that the national debt and the deficit are not the same thing. The debt ceiling was raised seven times when Bush was in office; it just received no media attention. It probably didn't even make the news. The people who listen to talk radio and get their information from bumper stickers are just zeroing in on it now, just like they did during the 92 election. The national debt has been around since George Washington (though the republicans will tell you that every nickel of it was Obama's). Most people either do not understand or do not want to believe that any bills coming due are the result of previous legislation passed by both the House and Senate and enacted into law. The President cannot simply incur expenses not approved by both the House and Senate. The current debt has absolutely nothing to do with future legislation. When debt comes due it must be rolled into new U. S. securities and probably at a higher interest rate if the ceiling is not raised. I continue to wonder where all that Iraq oil money went that was supposed to pay for the Iraq war. Any clues? It means, enough is enough, 'we're scared'. It means stop the wars, create jobs, let other countries defend the world; We can't afford it anymore. It is sad to say most Americans do not understand the real problems of not letting the debt ceiling raise. If we the U.S. goes belly up what will happen will make the Great Depression of the 30's you know the "real" one look like just a small bump in the road. What we have right now is just a half baked one with all in denial. If the debt ceiling is not aloud to rise then we all can say hello and must get used to our new third world status and the days of us being a firm leader will be gone forever. Jack–The debt c eiling debate is being held hostage by the politics of whether or not to raise taxes on big business. I even heard one official say on CNN today that buisnesses would create more jobs in America if they paid lower or NO taxes. What are these people smoking??? I'm a small business owner in Florida and I can tell you this. I'm not going to create aany jobs if my taxes are lowered. However, I WILL create jobs when there is more demand for my products and services...so I can keep up with the demand. That's true of all businesses, big or small. Right now, big corporations are sitting on mountains of money that they're not investing in jobs or anything else.....NOT because of their tax rate but because they don't have more customers beating down their doors to buy more 'stuff'. Boost consumer confidence among those who still have jobs and they'll start spending....and when they do, there will be jobs to fill.....because business will be making more money......and yes, paying more taxes as they should. It means the rabid conservatives have actually succeeded in fooling the majority into believing that all Government is wasteful and that the U.S defaulting on its debt obligations is no big deal. When the majority of Americans is THAT pathetically deluded, we're in big trouble. Unlike the Republican inbeciles, I believe most thinking Americans want the Debt Limit extended for obvious reasons. Not to do so could very well send us into another catastrophic abyss. I support my President 100% and if the so-called Republican leaders are too stupid to seize the offered compromise opportunities, then may they rot in a landslide defeat in 2012! It means that the people are not being fooled by the talk of armagedon if we don't raise the debt ceiling. We heard the same scare tactics and lies about wall street, the big banks, iraq, aghanistan and libya. Obama and congress need to stop taking payoffs from banks, wall street, and big corporations and do what is good for main street. Instead of obama scaring people by saying social security checks will not go out august 3 is they don't pass a debt ceiling on august 2 he should pick up the phone and order all military personnel, and defense contractors home from iraq, afghanistan, pakistan, libya, korea, germany, japan, and kuwait. If obama needs more money he should immediately abolish the useless education department and send his baketball buddy arnie back to chicago. Jack, it means the majority either doesn't understand the possible consequences of default, or just doesn't care. When the super-rich and large corporations get all the breaks, while the middle-class and the poor pay for it all, perhaps the majority thinks the consequences of default won't trickle down to them any more than the wealth ever did. And Congress doesn't care; they're still arguing about light bulbs. I can tell you one thing I am not one of them. We have to pay our bills and this is the only way to do it. Either the majority of the people are misinformed or stupid. Maybe we should default on our debt. Then when these same people start to feel the effects of not raising the debt ceiling they might then begin to understand why it was necessary. This is serious business and the people need to understand it. Maybe the news media wasted too much time on the Casey trial and not enough time explaining the effects of what happens when you default on loans. I don't know about the rest of America - but as for me, it means that I want to see the wealthy shoulder this burden - the corporations and individuals who have used loopholes to avoid paying the taxes that could pay this debt down. The middle class can't handle it. The "ceiling" has already fallen on us. What it tells me Jack is that the American people have lost all faith in their federal government to be fiscally responsible. Year after year and war after war America keeps borrowing money to prop up foreign governments while it can not pay it's own debt down. It's always borrow more money and increase the debt limit instead of cutting the damn spending and living within a budget. A budget by the way that has yet to be set for this year. That can just got kicked down the road. If this continues Jack the American people will eventually revolt. Jack there are at least three issues which account for the majority not wanting the National debt ceiling increased. First, this issue has typically been proposed and approved easily by Congress in the past. Now we have not only a polarized House and Senate, but there is a third, increasingly influential, Tea Party to which recently elected representatives are beholden to as they were elected on platforms which are inherently contrary to raising the debt limit. Also, this issued has never perpetuated to this level of National debate in the past. Most Americans have never been exposed to a basic foundation of knowledge in terms of the severe consequences if an increase does not take place. Finally, our political parties are just now looking at the issue from a realistic format which dictates that lumping all the issues... raising the debt limit, deficit reduction, revenue increases and budget cuts can not be part of a "Big Package" due to the first reason listed above. Now our National political leaders are starting to prioritize the dept ceiling issue and must be willing to segregate it as default looms near. In doing so, both sides of the isle may now speak in unity, at least within their own party, and gain more support from constituents. Because we know if there was a real problem all the usual ones be on vacation. Lets just leave it where it is this time. Jack, The "majority" of Americans don't read a daily newspaper and can't find Afghanistan on a map. Thankfully, majority opinion only counts on election day. Can you imagine if our legislatures were replaced by American Idol voting? It means: the information was collected at a republican rally, billionaire’s private club, an Illuminati conference, or all of the above. It's a polite way of telling Washington to "STICK IT"! If I reach my debt ceiling I CAN'T raise it and go on like nothing happens! Why should: Obama, the Senate, and Congress feel that they can do it? Oh that's right don't face reality, forget economics, be irresponsible! Didn't they just give themselves raises and great medical coverage on our nickle for a job "NOT WELL DONE! Do you really think the general public understands anything about the national debt ceiling? Doubtful...I am so ticked off at the childish battle between the politicians over this whole fiasco. I dare Boehner, et al to put their money where their mouths are! Call on every member of Congress to relinquish a chunk of their salaries and perks for a few months. That ought to peel some millions off the deficit. And no fair whining that the constitution won't allow it or the process would be too complicated. It is as simple as each of them writing a check to the US to give back money. C'mon guys, do what's right. It means 1) They don't understand the ramifications of not raising the limit and 2) They are completely disillusioned with politicians who seemingly spend money for every cause in every country but their own with a slant toward helping people who want a hand-out not a hand-up. How is that for Patriotism? It means that most Americans are about as abysmally stupid as the Republican party members who are now in Congress. This whole subject is going to plunge the US into a really unpleasant place in the world. I am glad that I am a 71 yr old man who will probably die before the impact of these morons really affects things like my social security, my retirement account, and my meager savings. What a shame. It means that a faulty poll was taken. If 500 people were polled and 251 don't raise it even though that is a simple maj. , it don't meaan a hill of beans. I think the number of Americans who do not want the debt ceiling to be raised is because they cannot understand how we live waiting for a catastrophe happen. Yes, their basic principles of balancing their budget is reasonable, but with dire straits pending these zealots have closed blinders on; thus, not being able to see the bigger picture. Same as the GM bailout. Yes, we should move toward balancing the budget, but I believe Bill Clinton's plan of raising taxes on the rich worked best; whereas, GW Bush's plan of reducing taxes for the rich has never increased employment or the deficit. For the 8 years Bush was in office, didn't he double the deficit with not one rejection of raising the ceiling from Republicans 7 times? The American people have been fed so much crap from the Republicans that they don't realize how much money has already been committed to for this years spending. Cutting spending over the next 10 years does nothing to the immediate problem of a $1.4 billion deficit this year. There is no way to not spend that money so there is no way to stay under the current debt ceiling. The reason I don't want the debt limit raised is because it will only give Congress more money to blow, and put us further in debt. Our Congress is like a kid in school. The more money he has to party on , the more his parents will give him if he asks. It means most Americans are sick and tired of the pain of seeing budget busting by Congress and the President! Perhaps, they are equally sick about seeing these wars draining all of America's last resources! What is the logic in bankrupting America with these punishing wars? After America falls into bankruptcy–who will be credited with bringing America down? Osama bin Ladin or Sodom Husein? Or emotional revenge? Okay! let's not raise the debt ceiling! Let's blame it on fate! The American people also overwhelmingly don't want anyone to touch their Social Security and Medicare. They can't hve it both ways. It's up to the Republicans to allow us to get more money in the coffers. It would not be a new tax increase, because George Bush already gave the rich people those breaks and it didn't work. Where are the Republican-created jobs from those "job creators"?All they did was allow the CEOs to rake in millions more. You can't call doing away with big tax breaks a new tax, it's just a return to the status quo. The Republicans issue edicts, not negotiation. It means that 42% of Americans are uniformed; they either don't know, don't care, or they want the economy to fail. Soooo, SAD. What I want Congress to do is come up with a plan that will cut spending, end tax loopholes and subsidies for the wealthy and corporations, and create jobs. Raising the debt ceiling won't do that. It means that 58 percent don't understand the problem. Where was this "majority" during the Bush administration when it was raised numerous time without any fanfare? Except for the tea partiers who were just elected, all of the Republicans fighting this voted for everyone of those increases without asking for any spending cuts. All they want to do now is make Obama look bad. Notwithstanding those facts, I understand the theory of not raising the debt limit, if you are tapped out on credit rasing the limit is not the answer to the problem. I would rather have no debt to pay, and we were on our way there until the Bush got us into this mess. Now we have few choices. Experience had shown that tax cuts do nothing to create jobs – or we would have plenty of jobs today. The Republicans have become bullies. Eric Cantor is like the child who throws his blocks down and won't play anything unless it is played his way. Money spent by folks in this country comes back to our small businesses and our taxes. Small businesses would prefer to sell more product than get government handouts through taxes. Some politicians may still be trying to "starve the beast", but in this complex world, it is a naive thing to do. It probably means that 42 percent of Americans are dumb as dust. It means that 42 percent of Americans didn't take the time to learn about what potentially might happen if the debt ceiling is reached. Or, it means that 42 percent of Americans watch too much Fox News. Take your pick. If the Debt Ceiling is Not Raised do payments continue to the Federal Reserve for Interest? Let’s get some accurate information about who will be Paid and who will not get Paid. Make no mistake, its the bitter truth, most American are ignorant, once they hear the phrase "raise debt limit" their ears raises like that of a rabbit but they have forgotten or simply don't know that the govt is asking them to do is pay the bills you have incurred. The Obama administration, the Democratic Party, our financail wizards, business leaders have not made the point crystal clear: This is not NEW debt! This is debt we OWE from items we already BOUGHT! If we have done this–raising the debt ceiling every year in the past when it was necessary without any fights, why would we jepardize this country to make a political point? The Republicans raised the debt ceiling every time during the Bush years AND they spent this money very easily: two wars and tax breaks for the wealthy and used up all our surplus! Why is that Obama's fault? Republicans constantly use the fraze: Personal responsibility when talking about the 'deadbeats' that bought a house and then couldn't pay for it. That is us–the USA–now pay the bill! Not sure but where have they been for the last 40+ years while our govt has overspent and loaded up the credit card? My sense is that just like our pols (who mismanaged the budget for years and just leave with benes for life), they're very frustrated and not up to dealing with reality. At this point seems our options are 1) THE ADULT APPROACH: agree now to a long term budget plan that eliminates debt over ~10-15yrs and authorizes debt ceiling to rise only until the peak is past then rachets down (and live within the plan) OR 2) THE OSTRICH APPROACH: NOT raise the debt ceiling, default on our debt, and hope the whole house of cards doesn't fall down, OR 3) THE TYPICAL POL APPROACH: another short term deal to kick the can down the road and plan to make the other party "pay" in the next election. btw, hearing all these pols proposing a bal budget amendment is needed at this point (the idea another law will assure they'll do what they know they've supposed to have been doing for years) is a JOKE. It means that too many Americans are watching FAUX news and swallowing their lies hook, line, and sinker! It means that only 42% of Americans are paying taxes and the other 58% don't mind that they do. It is pretty simple, that means that 42% of Americans are Republicans. What percentage of Americans understand what will happen if the United States doesn't meet it's debt obligations? What happens if a citizen doesn't meet their obligations? Will the stock market crash completely? Will the economy and unemployment be worse than during the "Great Depression? 42% of Americans understand that when you take on debt, you have to pay it back and it costs more than what you got. By saying no to raising the debt ceiling, they understand that government spending in the last three years has been exponentially greater than in the past two hundred and if spending isn't reined in, we won't own our country anymore. it means that wealthy wants more power over the middle class and poor. slavery with a dollar sign in front of if. it means that 42% of Americans are low information voters that do NOT understand what the "debt ceiling" really is, Jack. they listen to right-wing blather, mostly on "The F Channel", and think it's true. no wonder a person like Michele Bachmann can rise to prominence in American politics. I think you can boil it down to two things: either Americans want change in a radical form or they’re unaware of the consequences defaulting on our debt would have. To be an advocate of either signifies a serious sense of ignorance and complacency. It shows how people get swept up in the political rhetoric revolving around the negotiations of the debt talk, but yet forget the actual reason why these negotiations are even taking place. It illustrates how the majority of Americans don’t realize that any sort of compromise is better than the outcome of no compromise at all. Polls have little meaning unless there are attached consequences. Ask the same question but specify that Medicare payments, Social Security checks and veterans benefits would be stopped and you'll get a different result. Ok, imagine this. You can give yourself credit. You spend as much as you want. When you spend more then you take in, you give yourself more credit to pay your credit bills. Sounds great! The citizens are just jealous because they don't get to do the same thing...or maybe they expect government to live within it's means just like they do. Radical thought, I know. It means that many people genuinely believe that, despite what politicians say, the government should be run like a household. Annual deficits add up to huge accumulated debt. The public shouldn't worry, though, about the debt ceiling. The Obama administration, fearing a Republican stalemate, is ready shortly to implement a Plan B, which will permit the government to continue to function for 21 months without requiring any additional borrowing, and has targetted 14 areas of "savings" to get by on. The debt ceiling issue is a massive hoax, much like weapons of mass destruction in Iraq. August 2nd will come and go just like Y2K, and no one will notice. Politicians just want to deflect public attention away from the tax hikes that will soon be coming to a tax bracket near you. It means they dont know how the country works. We spent money for 60 years to get to this point. You dont get to turn it off now. We are not ready. Decrease spending over 50 years. It means that 42% of Americans are ill-informed, dont read newspapers or listen to the news, but are more interested in drinking the Kool-Aid of the Tea Party . Common sense tells 42% of Americans that we cannot continue raising our debt. If we had not started 30 years ago raising our debt, we would not be in the mess today. The solution is not raising the debt but to run a more efficient government and country. End the needless wars, close over 700 bases around the world, Stop pandering money to corrupt governments and increase tax on the wealthy 1%. At some point in time, we as a country, must live within our budget! Why should we raise the debt ceiling jack. just cut them off. id say take the credit cards away from uncle Sam at this point and let the people decide what they want to do with their money. i mean its clear the government is not spending the money wisely and its also clear that they don't want to fix the problem. but they want us to continue paying them to do a terrible job. i don't see the logic in that. What it means Jack is that 42 percent of Americans are totally uninformed of the repercussions and adverse impact not raising the debt ceiling would have on them directly. It's a clear indicator that many Americans continue to buy into the rhetoric of politicians as opposed to educating themselves and them coming to a conclusion or position. And these are the people that are voting for our National politicians. It means that many Americans are sick and tired of the Corporate Gangsters from Wall Street, the Banks, and many of the Wealthy Shareholders taking our Tax Dollars and running to the nearest tax shelter they can find and then blame the mess they make on Entitlement Programs and Excessive Government Spending. If we had some Law Abiding People in this Country that were enforcing our existing laws, then most of the Gangsters would be facing Racketeering, Extortion, Embezzlement, and Conspiracy charges, but when the charges would involve many of our Elected Officials, Members of the Judicial System, Lawyers, Bankers, etc., it is extremely difficult to get an investigation going since they would have to investigate themselves. Let the economy collapse and we will start over, the only other alternative is the same one that was applied to Europe in the 1940's! After the smoke settled, Europe was a better place to live! It means that 42% of Americans are still awake enough to know that Liberal government policies of the 1980s and ‘90s led to the creation of subprime mortgages; and questionable investment schemes by greedy Wall Street bankers have caused this mess, and that the Obama Administration will continue bankrupting us; unless we all wake up! It means that 42% of Americans just don't get it. They are the uninformed voter folks. It also means that 58% of Americans understand what will happen to our nations economy and world standing should we actually shut down the government. You 42% think things are bad now, just wait until August 3rd hits! Remember to thank the GOP for this should this happen. It means I am glad 42 percent of the population are not running the economy. Defaulting on your debts will have painful effects that will trickle down to everyone, nobody will be excluded and will punch a hole in the economy that could take decades to repair. You can solve your problems with maturity and hard work, or you can be childish and irresponsible, guess what the 42 percent are? Unfortunately it means the majority of Americans don't understand that money has already been spent. The spin the liars are pushing on us is that the sky is falling. This is the laziest Congress I can remember. They should return our money we paid them to work this session. Where are the jobs? The Republicans are now calling the rich, "Job Creators". They got their tax cut extension, but are not creating jobs. That lie is the bigger lie than a politically created crisis. THE DEBIT CEILING CRISIS IS A FAKE, MAN MADE, LIE. Now President Obama has gotten on the scare tactics bandwagon. Threatening that Social Security checks might not go out on Aug. 3, he is joining in on the fear mongering. When does the money for Congressional perks run out? It means that 42% of Americans are of below average intelligence and believe the drivel that the Tea Sippers and Republicans espouse. When these two miscreants take over the country don't blame me. I will never, ever vote for any of them. Pity we do not have a third party. Most Americans want more than they can afford and that has translated into the mess we are in. Americans will have to bite the bullet and have their credit shut off and pay higher minimum payments on their debt. This will translate into higher taxes, less spending, spending cuts and a balanced budget amendment..
Democrats, Republicans, Tea Partiers, the rich and the poor are going to all have to engage in America's newest undeclared war...the war on the national debt. One of the highlights of a democratic society is that an informed electorate choses the government that fits their needs. With this nation ranking only 16th and 27th in math and science how do you expect the general public to understand the scope of this matter. When the policitians tell the public that we can fight two wars and that we don't have to pay for them and that tax cuts don't increase the national debt what can you expect. Just use the All American Lie and the people won't know what to believe. It means that De Nile is not just a river in Africa. Or, perhaps politicians should frame the issue in terms they can understand – like foreclosure. The American public is fed up financing fools. TARP was a farce and everyday were hearing how the funds were misused and misdirected. The public has had it with the idiots in Washington. I think its time to let it fall where it may. Pick up the pieces and start from scratch. Washington needs a mental enema. Jack, what dies the term, "In Moderation", or something like that I sometimes see on my comments after I submit them? When are you going to have an open forum and let the audience ask questions? It means they have been deluded by the right-wing shriek machine. The debt limit, in itself means nothing, and the right has no real concern about the deficit except as a weapon to bludgeon President Obama and the entitlements programs. The real crisis, and the real solution to the deficit, is jobs. Repeat after me: FORGET DEBT, JOBS NOW! In a nutshell I think it means that many in the US have fallen for the Republican rhetoric. It would be interesting to see just how many of that 42% believe that leaving tax relief untouched for the top 1% of money earners would be a job creator. It means that 42% of Americans understand that this administration is spending too much. They know the debt ceiling is a credit limit and if they have it they'll spend it. They don't believe the Gov will default on its obligations because of some number thats not agreed upon. If seniors and military aren't payed its because the Democrats (President) wants to scare people and play politics with peoples livelyhood..
tampa, fl maybe we legal, voting, american taxpayers are just plain fed up with our representatives spending our tax dollars like monopoly money on everything and everyone that isn't american. they talk of having to cut medicare, but not their obscene salaries and perks, not ending all these illegal wars, giving money to foreign countries to like us, and things like $2,000 pens that work in space when a .05 pencil does the job. time to get back to reality, and living within our means. Jack, it means 42% of Americans have no clue how the economy works or what needs to be done to fix it. We need to cut some spending, but we also need that top 2% that controls the bulk of America’s wealth to start paying something into the pot. Bush’s tax cut didn’t create one job but will increase the treasury. So much for that fantasy. Going back to Clinton era tax rates won’t put small businesses out of business. The Republicans have done a great job of misinforming and scaring the economy-challenged and the Dems have done nothing to explain anything. ll they wanted was to work hard and support themselves. Where are the good old days? People see it like they see their own credit, owing more isn't a good thing, get it under control, so they don't want the ceiling raised. My opinion is it never should have gone this far that we would have put ourselves into a position where'd we have to raise the ceiling over and over, it goes to show you that government is broken. Could it mean that we don't want the tax burden for our children and grandchildren to be any bigger than it is now ? It means Republican propoganda is working. We are the reserve currency of the world. Despite our budget shortfalls we still have plenty of financial room to manuever for another decade at minimum once you get past the dramatics. Our navy rules the oceans. 25% of global trade occurs in the US. The only think that could make all of that plummet and cause complete world destablization is not raising out debt ceiling. Think about that the next time you vote Republican. I am having trouble understanding congress. Why are we borrowing money to give away to other countries when we need it so badly here????? It's easy, Jack. It just shows that our literacy rate must be about 42%. People are lazy in keeping themselves up to date on the implications of government actions/inactions. They simply listen to talking heads and follow their leaders like lemmings. Jack, it means that 58% are okay with raising the debt ceiling or are neutral about it. I don't know what else they can do–raise it so the government can pay its bills or default. The country is between a rock and a hard place; neither choice is one that anyone would make under better circumstances. But....I wish the politicans would grow up, stop the nasty politicking and posturing and pandering to their base. Only yesterday McConnell stated that he has no intention of ever negotiating with President Obama, that even a scintilla of tax increases (and/or closing the loopholes) for the wealthiest Americans is not up for discussion. Obama is willing to make spending cuts to Social Security, Medicare, and Medicaid. I think that Obama will cave to the Republicans, because that is his track record. But the problem is that this country will never solve its debt problems if the politicians continue to give tax breaks and subsidies to the top 1% of the wealth owners. To solve it will require BOTH increasing revenues (tax increases) AND spending cuts. It is like trying to lose weight–you have to BOTH increase your physical activity level (exercise) AND reduce your caloric intake (diet). Polticians should stop the kabuki theatre and look after the country as a whole, not just the corporation or businessman who gave them the biggest campaign donations. Jack, the poll shows that 42% of those polled are idiots and believe the drivle that the Republican party is doling out. When they stop getting paychecks; loans; unemployment checks, etc, maybe then the'll understand. But then again, the "Job Creators" will probably just create more jobs in places like China, Malasia and Bangladesh, then blame it on the Dem's. for not increasing breaks for the very rich. Do they think America is populated by idiots? Well...I guess they do have some things correct. Jack, it means 42% of Americans have no clue how the economy works or what needs to be done to fix it. We need to cut some spending, but we also need that top 2% of the freeloaders that controls the bulk of America’s wealth to start paying something into the pot. This is not new debt, but what the Republicans ran up over 8 years with Bush’s tax cuts for the rich, two wars and Wall Street bail outs for the rich under Bush. The future will take care of itself once we pay off the past. It means that our education system is failing us. It means people are either ignorant of real facts or don't realize how the government really works or they don't care about this country and are willing to take it down for a power. Jack, like a lot of Americans, I am just getting by and NOBODY is offering to raise my "debt ceiling"! We are sick of the government wasting our money on two wars overseas while families here are losing their homes, unable to find jobs and running out of any way to just eat and keep a roof over their heads. Get a clue, Washington. Live on a budget like WE do! It just means that 42% Americans are ignorant to the dangers of a default. While its extremely important to reduce the deficit, it can not be achieved over night. Republicans keep harping on tax breaks to rich 1% without any regard to the middle class and old population. What it means is too many ignorant people listen to Rush Limbaugh and FOX News. Must be the ones who get their news from FOX. It means that 42% of Americans could not pass an introductory course in economics. It means that 42% of the American public are fools. A good recruiting ground for politicians. It means that very little americans were polled. Raise the debt ceiling to pay the bills and then really get busy cutting back so we won't have to deal with this again. It means that Americans do not understand very recent history. George W raised the debt ceiling 7 out of 8 years during his 8 yr term. This is not something the public votes on. Repercussions are enormous and though I agree with most Americans that spending needs to be curbed, we should not jeopardize our world financial standing – not to mention the potential for out of control inflation – should the US default. It means only one thing... Most Americans don't understand economics. It means that 42% of Americans don't know what the debt limit means – that it means paying your bills on time. If you don't pay your credit card minimum payment, you get the equivalent of a big fine and increases to the percentage charged on your credit cards in the future. People who say the government should act like any household must do and live within its means should also realize that living on credit means you have to pay your credit card, and in this case it means you have to lift the debt limit to get that done. The battle should be fought where it belongs – deficit reduction has nothing to do with lifting the debt limit. It's simple, Jack, it means that 42% of the Americans are stupid. It means 42% of Americans value partisan rhetoric more than the warnings of world-class economists. Given the anti-intellectual stance encouraged by the GOP, I'm surprised that number isn't higher. Out of that 42%, how many of those people actually understand what the debt ceiling really is and the consequences of not raising it? How many times was the debt ceiling raised under President Bush? It just means that way too many people are watching Fox or are otherwise uninformed. It means that 58% of the people are NOT against it – simple. This HAS to be done – no question. It means a majority of our citizens care more about the future of this country than they do for themselves. If only the politicians felt the same way. Jack, we don't have the European Union to "bail us out" If we don't raise the debt we might just slip in the "Grease". and fall down along with the American dollar. It means that 42% of Americans deserve the economic fallout from not raising the debt ceiling. It means that the right's propaganda has worked well. Lying about what the debt ceiling means and how controversial it is has been the only tactic the Republicans have used. The Ryan plan that the Republicans voted enmasse for just this past spring would require raising the debt ceiling at least once if not more. So by even the Republican's best laid plans they require upping the debt ceiling. Considering how many Ameicans hacve defaulted on personal bills, seems to me that want to bring all the rest of us down with them by having the WHOLE country fefault too! To Congress it means nothing. think we should raise the debt ceiling. I personally feel we should default. Who thinks the average american citizen has a clue about what the debt ceiling even does or means. That is why we vote for leaders, we need them to lead and I want mine to lead us to more revenues instead of further sacrifice from the poor and middle class. Means that people know nothing about what will happen if US defaults. Not surprising when people (Republicans) care more about their own re-election chances, making sure obama is not elected and not about what is right. (Based on what McConnell said in a interview). If that many people are against allowing the country to pay back money it has already spent, we have a lot of frighteningly ignorant people in this country. That's the same 42% of Americans that live off their credit cards and apply for new ones to put off the interest with 0% APR introductory rates. Eat your peas america, its time to pay our dues and cut the fat. It means 42% if the polled Americans have no grasp of the consequences of default. They'll be screaming loud enough, looking for someone to blame, if they get what they want. Raise the ceiling. If you think that folks were upset when Sen. Chuck Grassley said Obamacare would "pull the plug on Granny", wait until Granny doesn't get her Social Security check. It means that 42 percent of the Americans you polled are idiots. It means that the public is misinformed and ignorant of world economics. We need the media to educate , without bias, the public. People are just saying that they don't want to raise the debt ceiling because they are sure the government will just spend more.It's like raising the credit limit on your child's credit card. No one really wants us not to pay our debts–what we have already spent–. We are tired of excessive spending particular a "stimulus" that creates no jobs and is a waste of hard earned money. In My Opinion And This Is Just My Opinion But What It Means Is The 42% Who Don't Want Congress To Raise The Debt Ceiling Are Foolish Because Who Wants The Government To Default? We Have Seniors, Disabled, Etc.... To Take Care Of In This Country! I Say Quit Playing Games Washington And Come Up With A Sensible To Plan To Balance The Budget And If That Includes Raising The Debt Ceiling Then Raise It. This Isn't Rocket Science We Have Innocent People That Washington Is Putting At Risk, Its Not About Your Re-Election Bids Its About The Economy Stupid. Do Your Job That You Were All Sent To Washington To Do! It means that 42% of Americans do not know what they are talking about – likely more than that. It means that the public does not realize what defaulting would mean in terms of the economy recovery (slow as it is already) not to mention the rest of the world. I doubt this 42% of the (uninformed) "public" who do not "get it" want more job losses, more housing crises and other things. Are they listening to Michelle Bachman, who says she thinks a default would not be a very serious deal or what? Debt ceiling negotiations: Russian roulette with 5 live rounds in 6-shooter. It means that 42% of Americans are ignorant to the fact that the debt ceiling is being raised to pay what we already owe and not what we will owe in the future. What it means is that millions of Americans have no idea what it means to default and have forgotten that the debt cieling has been raised (about) 14 times since Kennedy Admin. Bush's rep. stated that raising the ceiliing is simple house-keeping, based on money already spent. This is a badly played game. Wish Congress would grow up and deal. It means that 42% of the country hasn't done their due diligence. Period. What it means to me is that 42% of people are clueless how government works. If it's not raised, those 42% will vote against those that wouldn't allow it to happen. it means that only 43% of Americans can balance their checkbook. It means that the American people know even less about the economy than I initially feared. It also shows that with issues of this magnitude, policymakers need to ignore the American people, who have a rudimentary knowledge of economics at best, and heed the words of experts like Timothy Geithner and Ben Bernanke. It means the government doesn't give a crappy what the American people want. It's just another example of how out of touch they are. Probably that they have no appreciation of what this means economically. This is NOT the time to draw THIS line in the sand and these 42pct don't know just what this line means! We absolutely need to raise taxes and cut spending. We Americans want more with less. But like any club, you have to pay your dues. I'm a fan of the United States of America club and ready to pay more taxes to keep our country on a firm footing. Control spending, yes – but pay into the club! It means 42 % of Americans don't understand that the debt ceiling is not to be able to spend more but raising it allows us to borrow the money to pay the debt we have already incurred. Or it could mean 42% of Americans are almost as smart as Sarah Palin. It means that they polled the same 60% that didn't know that President Obama was a Christian. Polls are interesting for 'who will you vote for', but when they requires knowledge they are useless. I think it means that our educational system is broken, because apparently 42% of Americans don't understand basic math. It means that the 42 percent of don't understand the consequences of the Government default. Its a sign Jack that some Americans are incompetent and they're the ones who just vote for the guy who's on tv the most. It means that 42 percent of americans are totally out of touch with the capitalist world we live in, like it or not. If we want to see The Great Depression Part 2, than let's keep up the bipartisan bickering until after the riots and protests start here like they did in greece. Jack, 81 percent of Americans support raising taxes on those earning over one million. Why not ask Boehner, Cantor and McConnell why they are not listening to the people and only to special interests? I have to depend on 900 dollars monthly on Social Security. I e-mailed my congressman, Senators and President NOT to give in to the aforementioned blackmailers. And yes an interruption in checks will hurt me, but caving to the right will be far more disaterous for our nation. 42 percent of the americans polled do not want the debt ceiling raised without spending cuts...this is a plurality as used in the Congress and the Senate to pass most of the bad legislation passed against the taxpaying public. Too bad it does not apply to polls, surveys or public (taxpayer) opinion. They are safe..even if they are kicked out...retirement of full pay for life. Its an unbeatable deal. People are naive of the consequences. It means that the misinformers are successful in misleading the public on this issue. That's why they keep calling the closing of tax loopholes and repealing tax cuts for the wealthy, "raising taxes". This goes virtually unchallenged. No one is recommending tax increases. Fraud and tax cuts to the rich are primarily responsible for the debt, not social programs. It means that 42% of America doesn't understand that a weaker economy means their investments will loose huge value. The govt needs to break the issue of raising the debt ceiling from cutting cuts. Raise the debt ceiling, then get back to work, cut expenses and raise revenues. If the Republicans don't want to raise taxes on the rich then they need recommend an alternative to generating revenue. This is worse then "Are you Smarter than a 5th Grader?" Only those who are brainwashed by the Tea Party don't want the debt limit raised, and they are not thinking, just reacting. With no increase in the debt limit the Gov't. will hut down. There goes our SSocial Security checks, our Medicare payments to our doctors, on and on. Is this really what you want, Jack? It means no one is doing an adequate job of explaining what will happen. It means reminding people that the debt ceiling was raised 7 times with skyrocketing debt under W. And it means I have real fear about what my fellow citizens could approve of or lead us into. It means they have no idea what's going on. Don't get me wrong; the idea of having to raise the limit makes me want to vomit, but the idea of defaulting makes me want to stock up on can goods. The problem we need to focus on is not that we have to raise the limit, it's that Washington has put us in this position with excessive spending and tax cuts. It means that 42% of Americans are idiots! What does it mean? It means that almost half of the citizens in our country don't have a basic understanding of economics. They don't get that despite all this bluster, the Congress has to and will raise the debt ceiling. What a circus. That most American's are too stupid to realize what will happen to them and everyone else should we fail to raise it. I blame it on the republicans trying to appease their far right base. they need to think rationally and agree to some revenue increases while agreeing to very large cuts/ restructuring of other expenses! They say they want to create jobs and help America succeed, instead they will find they have another Greece on their hands! It means people are tired of watching the overpaid buffoons in Washington kick the can down the road so they can avoid taking a stand and risk their cushy taxpayer supported career. Either they find a way to compromise on a package of cuts and revenue increases or voters in this country should throw out every encumbent up for reelection in the next three years. They just do not get it. The money has already been spent. We need to pay the bill now. We bought it; we should own it. Worry about cutting spending and taxes another time. Jack it means 42% of the people out there have no clue. The republicans are playing their campaign fiddle to their uninformed easily swayed base. This is a big deal it has always been a routine act to raise the debt ceiling. They should not be holding it hostage to pass spending cuts. Yes the spending needs to come down but not at the risk of a economic catastrophe. It means they are smart. It means that 42% of Americans are totally ignorant of what this really means, not just for us, but the the whole world. We are putting the world at risk if we don't raise this ceiling. These 42% of Americans that believe we shouldn't raise the debt ceiling aren't seeing the bigger picture. They simply believe that the government will shut down for a while, Congress will wake up, and we'll get tax reform and spending cuts. No harm, no foul. They are not realizing the ripple effect that defaulting on our loans will have; not just here, but abroad. Congress needs to quit worrying about spending cuts and tax reform and raise the limit. Only after this crisis has been averted can we worry about paying off our debts. It means that 42 % of america watches fox news. it means that 42 % has no 401 K or investments of any kind. The world markets are already antsy and we still have weeks to go. It means we are a foolish nation of idiots. Jack, I don't want the debt limit raised but I know that it is something that we must do, as repugnant as it is. Only a moron wouldn't want the debt ceiling raised.The interest rates hike alone would bankrupt America.Maybe China needs to call in their debts and force the US to pay off all debt we own them at once.I say sell Hawaii and Alaska or just give both to China to settle the debt. it means that 42% of the country doesn't understand the problem. i doubt if they would let their own bills go unpaid. Are 42% of Americans ignorant as to WHY we have to raise the debt ceiling? Don't they know that it's to pay PAST debt and not future debt? What if These same 42% were owed money by the government? Would they be content not to get paid for services they performed or for goods they sold? Hmmm, I think that if the government decides that they are not going to pay their bills, then why should we pay our taxes, our credit cards, our mortgages, etc?? I didn't realize there were so many Americans so caught up in reality shows and such that they aren't cognizant of the critical nature of this decision. WAKE UP, AMERICA!! Jack, it means that 42% of the population of the US does not understand basic economics. Yes, there is a lot of spending. Yes, we need to raise taxes. We need to stop the hemmorrhage our financial resources into the military industrial complex, we need to bring our boys home. The middle class and the poor can't carry everyone else on their backs. Raise taxes for those who make the most. Plain and simple. They beneifit from all this spending too but pay far less than their fare share. You're comment "the american people want government spending to stop" you neglected to include AND they want the tax breaks for the wealthest americans to stop. It shows that 42% of Americans don't fully understand what raising the debt ceiling means. Most of those opposed wrongly think that raising the debt ceiling is allowing for new spending, and don't realize that it pertains to money we've already spent. They also don't fully realize the consequences of not raising it. It means they do not have a clue. This is a big country with a huge number of responsibilities. One is to stay solvent by raising the debt ceiling and cutting spending. No one is proposing not to cut spending. Maybe we should find out what part of Congress benefits have been cut. Also, where are all the jobs created with the tax cuts. Get us numbers!! It means that the public does not understand the issue. If they did understand how terrible this could be we wouldn't be having this debate.I also wonder if all of these t party freshman in congress understand the danger they are putting us in. It certainly doesn't seem so. We have been told so many times that the sky will fall in if we don't let politicians spend more money, that now when the sky might really fall in we aren't willing to believe it. I am very scared and thinking about learning how to plant crops in Brooklyn in order to eat. It means that 42% of the people polled have absolutely no clue or understanding of the impact if we do not raise the debt ceiling and have become 'brain washed' but the Tea Party who are completely myopic and close minded. If they think things are bad now, just wait and see what 'bad' really is if the US defaults on our obligations. Jack – it means that Independent, Republican, Democrat, and Tea Party voters finally seem to agree on an issue. What it also means is that our representatives are not listening to us. Where are the true leaders when you need them – those who aren't media-gluttons. Can't the middle-ground Republicans and Democrats please stand up? It means that your survey results are skewed as usual!! 42% of Americans don't want the debt ceiling raised without a plan that cuts spending and a solid plan for debt reduction. C'mon Man! We have an uninformed population regarding important matters. Even worse, the population is never presented with significant explanations of complex matters. We have a population which is fed 'short slogans' and 'code words', and that is the extent of the explanation of these important matters. It is unimportant whether 42% of the population does not want to raise the debt limit. It is not a choice. It reflects very poorly on the political body of knowledge of the electorate. It means that 42% are either ill-informed or are nut-bag teabaggers. Our economy and the Global economy would suffer Trillions in loses and would make the Billions the teabaggers are wanting look like peanuts. The biggest problem in this Congress is that the GOP is scared-to-death of the Tea Party and their extreme Right views. Term limits are sounding more and more logical....way too many of the politicians are entrenched and fed by Corporate lobbyists...now the White House is up for sale since the Supreme Court said Corporations can donate unlimited Billions ....where are we doing America? Cutting benefits to the elderly, disabled and poor....and not touching the sacred Military elephant....my my my!! Jack,you asked what it means that 42% of Americans polled believe the debt ceiling should NOT be raised, to which I can only reply, they are ignorant of what exactly raising the debt ceiling means. They think it equates to runing up charges on an overextended credit card; they don't realize it's actually borrowing money to pay the credit card bill we already DID run up. There needs to be more education on the issue, and less "politicking." It means that 42 percent are idiots and would rather prove a point, hold the country hostage, and stick to their ideology rather than look out for the best interests for the country as a whole. Defaulting on our debt will be financial Armageddon for everyone, including them. What it means is that the average American is as ignorant about economics as they are about being able to name a supreme court justice, who their representatives are or what the capital of their state is. Most Americans vote based on 10 second sound bites of erroneous information. That's easy Jack, it means that 42% of the people responding to the poll are smarter than 100% of the people that we have elected to run this country. Cut the national budget? That means more jobs lost – civial cervents, teachers, postal workers, CIA, FBI, treasury. More people out of work. Bring the troops home? To what? No Jobs? No work? No unemployment? No welfare? Every action creates an equal and opposite reaction. Don't raise the debt ceiling? The American Boat will finish the process of sinking that the Republicans seem to want. Don't worry. The Big Corporations and the Wealthy will have LIFE boats, just like on The Titanic. And the rest of us will be locked on the under decks as is ALWAYS the case. Right Jack, it means 42% don't understand macroeconomics or politics. No increase in the debt limit means a stock market crash and world-wide economic chaos. But that's ok; it'll just push my gold holdings higher. I'm alright Jack. It means that the 42% aren't paying attention. If the debt ceiling is not raised it could be catastrophic for the world. Ireland and Portugal have had their bonds labeled 'junk' now by Moody's and Italy may be looking at the same thing. We are in a precarious financial situation worldwide. A newscaster said yesterday that our citizens, many of them, are upset that the debt ceilig may be raised but have no idea what that means. They think it means we will spending for money. Instead, it is to cover money we've already spend. Dear Jack: What it means is that most Americans are totally ignorant about economic issues. When economic issues are mentioned in the media it is mostly in terms of blurts. I don't think most Americans understand the consequences of not raising the ceiling or why Republicans oppose it. CNN should Krugman a half hour to explain it. The Republican Party is not a party. It is a lobby for the wealthy. Conservative Republicans are anally fixated obsessive-compulsives, hostile, controlling, authoritarian,domineering, and paranoid. Their views are not rational. They are emotionally unstable. They want an unregulated predator-prey society in which people serve the wealthy, the entrepreneur, hustle a buck Joe and mark up Jack. I am a clinical psychologist and college teacher, now retired. Most Americans simply don't understand the consequences of NOT raising the debt limit. It would be catastrophic. Understandable that they are upset about it, but so much of the debt goes back to 9/11. We can't all of a sudden right all the wrongs. It would be nice but can't be done in one budget. It could mean 42% of Americans no longer have anything to lose and don't give a hoot. Jack you math wiz it means 58% could care less. ....it tells me that 42% of Americans are relying on the lax Canadian immigration laws. It means the American people don't understand macroeconomics. What a sad day for the American economy and the American educational system. It means that we are tired of Obama's spend, spend, spend mentality. He is like the person with a checking account that has lots of checks left without caring about the balance! Forty-two percent of Americans want to leave the debt ceiling where it is, even though that creates a substantial risk of an economic meltdown. Curiously, Gallup polls over the last 30 years consistently show that between 40 and 45 percent of Americans believe that the Book of Genesis is literally true. Could it be the same group of people? Jack, you ask, what does it mean 42 % of Americans do not want the debt ceiling raised? It means 42% of Americans do not know what raising or not raising the debt ceiling is. Nor do members of the House who are tying in cutting spending with raising or not raising the debt ceiling. Jack, this just means that 42% of Americans never went to college and had to take a required economics course. Populists are "popular" by definition, it doesn't mean they should run the country. We need world-class grown-ups making these decisions, not "I'll hold my breath until I get my way" obstructionists. It means that the majority of the Americans that, not raising the debt ceiling would affect, have no clue on economics. This would be calamitous. This could tank the economy and have a Global effect on our ability to function as a nation. Don't even get me started on the number of people that may not get paid and those who may get laid-off. Unemployment could jump, interest rates could go sky high and we would have a total economic meltdown. People just don't get it...this is not about disliking President Obama...they do that quite well as it is, this is about keeping the nation and its people solvent. I think its saying that 42% of Americans are willing to not pay what they owe. Which is a big reason why we are in the spot we are in today. People borrowed more than they shoulld have, defaulted, then had the gaul to blame the banks and the government for allowing it. Its sad. Lets stand up America and pay what we owe! And please find a way to put politics aside and actually do something about this debt ceiling. Not delay delay delay. Thats all Washington does...o and it ALWAYS focuses on the next election. When did elections surpass the needs of the people of America? When we put the welfare of AMERICANS first, then we MAY begin to see the light at the end of this long gloomy tunnel we are now crawling through. This means that most of the American people are ignorant and do not realize the consequences of what will really happen if we do not pay our bills. If our news outlets were responsible and talked more about economics and the results of what happens when nations do not pay bills or collect enough taxes rather than spend 24/7 talking about a failed trial, chances are the public would be better informed. Fox news is a loud voice that has influenced people and contributed to their ignorance. We need a news channel that is louder that will influence people and inform them of reality. What happened in 2010 was a good example, and directly affected what is happening today. The same people who are saying to not raise the debt ceiling are the same people who were conned into voting for the Tea Party. DIdn't that work out well? It means two things: I) quit borrowing money to pay expenses. children understand that poor policy. 2) the media and the congress always fail to defeat spinners that lie to the public. THE OVER SPENDING HAS ALREADY HAPPENED! Thus this is a do it first and say i'm sorry deal that keeps being repeated and is the only reason Social Security has a problem: ie; because CONGRESS raided the savings account! Honest Congressional leaders should resign rather than 'go along to get along'. They are Selfish and Greedy wealthy people. WHO exactly was polled for the 42%? At least half of the US is very uninformed about most things financial or political. And many have blind obedience to a conservative agenda that really does nothing for them. What ignorant pawns. We need spending cuts over ten years and increased taxes for the wealthy who HAVE profited the past 10 years. What this percentage represents is that 42% of those polled have absolutely no clue as to how devastating not raising the debt ceiling will have. Like most stories tea baggers and others of their ilk hear played time and again on the news, repercussions from impending situations such as this always happen in some one elses back yard, not their own. It would be interesting to see how the demographics of the 42% breaks down. Those that fall withing the sub-set that rely month-to-month on the entitlements being threatened will sing a much different tune come August 3. If I were to max out my credit cards and can't pay them off, I suppose I could ask my bank to raise my credit card limit. And most probably, unless I curb my spending, I would eventually max out that credit card also. It is time for our government to learn how to live within its budget. I have to. That just means that there are hopefully 58 percent of Americans that are sane! Remember those old nuclear war posters about what to do once a bomb is dropped. The last on the list was to kiss a certain body part goodbye. The fact that so many people do not understand the issues invovled in the debt ceiling and that it represents money already spent by the government on behalf of the people is just as scary as a financial nuclear bomb. We know that there will be untold damage from the initial impact, but the fallout and the residual damage could impact generations in the future. Education is expensive, but ignorance is so much more costly. Jack, Congress and the President can barely agree on what time zone their working in. We got into this debt problem because previous Congresses and Presidents wanted to fund well meaning programs. The problem was that their economic assumptions about revenue growth were very wrong. Medicare Part B is a wonderful example. Rather than show restraint, t hey went ahead and approved all sorts of programs or expanxions of programs. It means that more and more Americans like me have come to the realization that utter national and international economic destruction and collapse may be the ONLY thing that could force some of our idiotic, corrupt politicans to abandon their self-serving ideologies and actually start working together for the best interests of the country. Worldwide economic disaster? BRING IT! Maybe it will FINALLY wake some people up. raising the debt ceiling. They are unaware of the consequences that could actually destroy the economy and create worse problems for us. They forget the vast amount the Republicans (George W. Bush and Co.) added to the debt and thus help to create the problem we currently facing. It means they don't pay attention to our government and what has been done in their names. It took this country 30 years to get to todays jobless rate and the debt to become this high. Now they want Obama to simply flick a switch and make it all go away. That or it's his fault. It means that 42% of Americans need some serious education in current events. If we don't raise the debt ceiling, I might not get my August Social Security check. My retirement savings might disappear ... again. That happens, ain't nobody with the word "Incumbent" besides their name is getting re-elected - Republican or Democrat. It means that 42% of the public do not understand the ramifications of what they desire. And that is a very scary fact indeed. I too would like to see the debt ceiling not raised, however it is not as simple as taking away the credit card as some portray. There needs to be a plan put into place that addresses our financial problems, but taking a simplistic approach is not how to do it. There is so much more that needs to be done to solve this problem and that is what 42% of the public does not realize. It means 42% of Americans haven't been paying attention and don't know what's going on! On the other hand the just want a balanced budget going forward. These 42% individuals do not understand the financial implications of not increasing the debt ceiling. They are misguided individuals by vested interests for selfish motives. Such an attitude at this juncture is irresponsible and unpatriotic for the country. It just goes to show you that many people in America do not understand the ramifications if the debt ceiling is not raised. They just latch on to sound bites that Republicans and tea partyers are putting out there. President Obama should be cynical enough to say ok and allow the deadline to pass and allow some of the chaos it would cause to start. Maybe this might shock the Republicans and the people who believe that it is not necessary to experience what would actually happen for a short while. Maybe then the Republicans would allow taxes on the wealthy to be raised to help solve this problem! and kick off all recipients except those approved. by panals of medical experts as being disabled physically or mentally. It means that people are sounding off without thinking, and without wanting to know the true consequences of what they're voting for. It scares me to see how many Americans voice knee-jerk reactions without thinking - a trait that reflects upon their education. How well are our schools educating its students to prepare them for participating in our democracy? Judging by the popularity of politicians who would ruin our full faith and credit, putting our country at risk of economic peril, our educational system is not working. Well Jack, it means that 42% of us are dumber than dirt in a vacuum cleaner factory. Meanwhile, the rest of us get to watch miserably while, not just the country, but the whole planet circles the drain. If we're lucky, earth mother will reach out and scrape the planet's population of bipedal fleas back to a manageable number. If not, well- WW3 is just around the corner. It means that far too many Americans don't understand the economics of this country. Can you blame them? I'm one of them. My understanding of economics is pretty simple; don't take more out of my checking account than I put in. But this simple logic is lost on our govt. and legislators. It's all about politics, what a surprise. Congress isn't taking chances with their own salaries, it's the American people who pay for their bad decisions, so why should they care? Come election time all they have to do is blame the other party and since so many people really don't understand the intricacies of what they've done, they believe what they're told. It means that 42% of Americans don't understand financial markets. Period! and the current debt limit situation in particular. It means they don't understand that debt is defined as the money you have already spent. You theoretically can't cancel debt unless you declare bankruptcy and that is what would happen to the US debt if the limit is not raised. I would like to know the location of all the jobs created during the last decade of Bush tax cuts. We should all go there–because that is where the next ones should also be if these tax cuts continue. Oh oops, maybe trickle down economics really is just a slogan. People are opposing it because they want to see the president fail. They want the president to fail because they are republican, bigoted, ignorant, or all three. The educated people who have doctorates in economics all say to not raise the ceiling would be a desaster. It would put not only our country, but the world into a deprssion. It means that most Americans have their eyes shut to the stark realities. The United States cannot default on it's debt, what that says is that the United States refuses to pay the bills it has ran up, a credit crunch will tighten the noose around our necks. The Republicans have behaved very irresponsibly and irrational with the debt limit issue. They were naive to think they could bulldoze over the Democrats and get whatever they wanted while granting the Democrats absolutely nothing. For Cantor, of all people, to do this is a JOKE. This is the guy that raised to debt limit about half a dozen times, NO PROBLEM. Guess it means to me that 42% of Americans would rather play Angry Birds than read a newspaper, take an economics course, or understand where candidates really stand on issues! It doesn't mean anything. Most people have no idea what the "debt ceiling" is and never cared about it before now. It's ridiculous. Ask if the U.S. should pay its debt or issue Social Security, Medicare and military payments to eligible recipients and you'll get a very different answer, I'm sure. It is time US lose its place as a leader in finance. Given that USD is the global reserve currency the congress is playing with fire here. The morons in congress can cause a global disruption by a default. Time and again the leaders of this country be it president or the fools in congress are proving that US is a country that is way past its prime and is no longer the leader of the free world. I feel that the 42% listed as against increasing our debt ceiling are not carefully watching/reading ALL that is available about this issue. There are way too many Americans who only listen to what they want to hear, watch what they want to see; they are not opening their minds/eyes and ears to both sides. Our politicians are far too hostile toward one another's ideas and there are only a few who understand that we need to work together to resolve our huge threatening problems; that means both sides must give some and work for the better of the country rather than their re-electability. The debt we owe is money we have already spent. We must not default but we must work to get control of spending and not desimate the middle class. Work together, speak the truth to Americans and stop demagoguing! It means that 42% plus Eric Cantor, Michelle Bachmann and the "not sure" group don't understand the consequences. Stop saying spending cuts which sounds good. Say that people who get Social Security checks, Medicare reimbursements, military wages, are government workers are going to get a lot less in their checks. Treasury holders, our credit rating and financial markets will take a big hit. When the you know what hits the fans and the screams start, you can be Cantor and Bachmann and the rest won't remind us they were against it. Why are the party leaders letting them call the shots? It means that the majority of Americans believe the unrealistic spin that the debt ceiling has anything to do with this congressional budget. My fellow americans are unwilling to believe that the need to raise the debt ceiling has stemmed from several wars and the greed of unregulated investors gone mad over quick money without consequences. This all started back with pappa Bush and escalated way beyond proportion accelerated by the twin towers falling. Osama won. are we happy??!!? It means that 42% of Americans spend too much time watching political soundbites on the news and believe whatever their politicians say and not enough time on research. Additionally, it proves that the American education system is an utter failure. People need to stop listening to what everyone is saying on television and think for themselves. How would they really be effected if the government defaults on loans, is unable to send monthly checks or has to close government offices (USDA, EPA, SS, etc...)? Everything stops and we will ALL be negatively effected. Oops, I forgot the Republican party will receive a positive effect; they plan to use this as a campaign tool. I t means some people are aware of what DC is doing, i am unemployed and my wife is on social security so it hits here really hard. I am 60 and i never thought that our country would be in this shape, our founding fathers must be ashamed of what they see. I'm one of the 42%. Many of these individuals predicting the "sky will fall" are the same ones who told us we had to bail out the banks, wall street and insurance. They are the same one who said if we spend more and increase the debt, out unemployment would have dropped. When should I or any one believe the glum being predicted by individuals, many who were on Wall street at the time it colapsed. Also a noted economists at U. of Maryland who does have a track record of be more correct than wrong states the levels of taxes coming into the government are more than enought to pay interents of loans, pay our military and for those on social security. Maybe congress and the President needs to lead by example. How many will cut their salaries by 60% and reduce staff to levels of 1970. How many will give up government jets and fly commericial to a senior may receive medicare. The 42% figure might be easily explained. 50% of the American public is below average in intelligence. It is a little remarkable that 8% could remember enough of their 3rd grade arithmetic to figure out that the country will not be able to pay its bills unless it can borrow more. It is disheartening, though, to think that the 42% probably includes some sharper individuals who oppose meeting our debts in order to ensure that our President fails. Anyone who has amassed a daunting amount of debt knows that it takes a long time and a lot of hard work to pay it back. This is a time to roll up our collective sleeves and work together. Pulling the house down around us because the mortgage is too high is a stupid idea. They have had their head in the sand for at least ten years and six months. This problem didn't just start in 2009. Who was it that cut taxes, started two wars, (one unnessary) and let the bankers run wild. Start cutting spending with the foreign aid to the countries who hate us. I find the situation sadly amusing. Sad that so many do not comprehend the process while amusing that the Tea Party act as cheerleaders for the Ryan plan passed by the House for next year that itself includes an addition ONE TRILLION dollars in Debt. Even more sad, the republicans in congress have passed this and NOW say no debt increase WHILE passing an additional ONE TRILLION in projected debt with 36 more years (according to the Ryan Plan) of deficits BEFORE we reach a balanced budget. It means there isn't anyone in Congress including those running for President who can build consensus and lead. It means that they care more for their party than the country. Your extremely conservative stripes are out there for everyone to see. You don't even pretend to be independent. Maybe you would be a good person to take Beck's place at Fox News. People would rather increase the taxes on the super wealthy than cut needed social programs. A fair person would mention that. It means that 42% of the people are economically ignorant. They also believe the government is crying wolf when it says that all hell will break loose if the debt limit isn't raised. The budget and debt should not be tied together in the same bill. It means people do not tend to listen to the elected officials. What good does it do to elect anyone if they cannot even put too much faith into them? Not to mention that 70 million people on social security disability and other types are in dangerous and if they lose, so will the elected officials come Nov. 2012. This is not the time for knee jerk reactions. Yes, we need to get our financial house in order but don't throw the baby out with the bath water. A lot of Americans don't understand Economics 101 and that is just sad in this adverserial climate in Washington. If our politicians would act more like statesmen and less like perpetual candidates for re election maybe we could accomplish more. I feel like I'm watching Jerry Springer in the Congress of the United States. The people that don't wnat the debt ceiling raised are living in a fairy tale world and problay only listen to Rush and vote for tea party candidates, but if it is not raised they will be the first one screaming that their 401k and stocks have bottomed out and they will of course blame Washington. That 42% are very stupid pwople and do not think beyond their hardened beliefs that Fox News feeds them. It means these are the same people who are waiting for a world series between the Chicago Cubs and the Cleveland Indians; they are delusional. It means 58% of Americans work for the Government, work in the military,or are on Social Security.You see what we have here is a what in it for me citizenry. Who care if my neighbor is out of work,as long as I have a Job. Who carse if my neighbor will lose his house,It not me. I have health care ,my family has health care, I could care less about my neighbor. 42 % of Americans are : WHAT IN IT FOR ME. If 1% of Americans own 40% of the wealth in the USA, don't you think we should take back some of what they have gained instead of depriving the poorest amongst us of our Medicare and Social Security. Didn't Warren Buffet suggest that the wealthiest 1% should be taxed at a higher rate to help us through these tough times? It was back in 1985 when that 1% owned 18% of the wealth, I think. It means people do not tend to listen to the elected officials. What good does it do to elect anyone if they cannot even put too much faith into them? Not to mention that 70 million people on social security disability and other types are in danger and if they lose, so will the elected officials come Nov. 2012. It means 42% of American reflect the poor quality of our schools because they don't understand how governments work. I bet the same 42% support the Afghan and Iraq wars - which were not paid for. Nor the medicare prescription drug. Here's a couple ideas: Let's end the Medicare Part D program. Let's sell war bonds to pay the debt created by the wars. Let's stop all federal funding of roads. Make everything private. Then ask 42% the question again. I suspect it wouldn't be 42% anymore. Jack! 42% of Americans are on drugs! Maybe they should share them with Congress!!!! Oh Maybe if they do reise the ceiling they could repay the monies they Borrowed from our, yours and mine SS Fund. I don't think many Americans realize the consequences of not raising the debt ceiling, it could prevent Seniors from getting SS Checks, no money for schools and other programs and what it will do to our standing with the rest of the World if we don't pay our debts. The Head of the IMF said it could have serious consequences on the U.S. if these bills are not paid. In my opinion... I don't believe that more than 40% of Americans understand debt. And they don't care if the country defaults. Small children say to parents mommy if we don't have the money charge it and the Republicans and Bush did just that. History in school could not be taught or there would be a better understanding of debt. Bush raised the debt over 4 times in his 8 years, Went to war in the wrong country without a plan or money to pay for it. Where was John B and Mitch Mc. then. President Obama made a debt that would help even the lowest of station of class in the U.S. The debt the Republicans ran up helped only those in the war effort by using fear tactics. We the people should have used FDR's slogan "The only thing to fear is fear it's self" And some got mighty rich. What made America great during the depression and WWII was the poor pitching in (which was most of us)., sharing the burden, and paying their taxes. Now if the Rich could pitch in and share the burden (by giving up their tax breaks). They could rescue our countries saddest moments since the great depression and WWII. Or they can continue to let our children and grand children pay for their luxuries. It is not the Americans that will write their history wearing rose colored glasses. But the world will see a truer picture of the fall of the United States and Capitalism. It means that a lot of us are fed up with the political gamesmanship and scare tactics (like Obama threatening to stop payment on Social Security checks). I think we are dealing with funny money anyway and maybe it is time to call their bluff and let the deadline come and go without raising the debt ceiling. It means the common American neither realizes nor understands global economics - or economics for that matter. We have grow accustomed to the "free lunch", yet we are not the premiere global economy who can call the shots, like your father's or grandfather's America used to do so. We are voice in the global chorus - nothing more. Our expanding population should demand increased services from our government, and we should tax accordingly - but instead we continually vote and reward those who vote against our economic nationals interests. Dont' believe me? Then why do most GOP states receive more federal dollars (spending) than they pay in federal taxes? How can Republicans put up such a fight for raising the debt ceiling now, after raising it 7 times during the Bush administration. I know there are many stupid people in America, but cannot understand how so many of them end up on capitol hill. The conduct of our elected officials right now, at this moment....is the lowest I have ever seen. I am embarassed and frustrated to be an american right now. I am also astounded that all these supposedly smart people in Washington think that we cant see whats going on regarding political positioning. I am sick of sound bytes from both sides and would like to hear three things. That the debt ceiling has been raised, taxes will be raised for the riches and our spending cuts are appropriate enough to save this country. It seems like both sides are "Hell-bent" on proving a point so if the government does not raise the debt ceiling and we begin to spin in financial chaos then so be it! The President has agreed to 4 trillion dollars over the next ten years with sharing the burden with elminating the Bush tax cuts. Republicans want to cut spending from the programs which support the Poor and Middle class and do not want to ask the wealthiest of this country to pay more in taxes simply because they believe that the non-taxing of them will create jobs or "Trickle" down. This simply has not happened since companies are sitting on trillions of dollars and no jobs are being created. Sorry, but maybe allowing this country to default will allow those to wake up! Brother can you spare a dime? Correct if I'm wrong, but hasn't the debt ceiling been raised appox. 75 times since the 1960's? And didn't we raise the debt ceiling 6 or 7 times under President George W. Bush? In fact, my understanding is the only time the debt ceiling was not raised was in the last 2 years of the Clinton administration when we finally had a surplus. Why are the republicans suddenly so concerned? Do you think it has anything to with the upcoming presidential election in 2012? No way! They are only concerned with the good of our country. Give me a break! It means that 42% of the people do not have any idea of how much the economy and their well being will be impacted if the USA does not honor our commitmants. Also, it means that a majority of the people that are in the house of represenatives are incompetant and unfit for their jobs. Many plans to reduce spending and raise revenues have ben rejected. It is time to cast politics aside and for congress to perform its duties. It means that just like I have suspected for a long time, at least 42% of all Americans are either ignorant ot just plain stupid. No body wants to raise the debt ceiling and spend more money.There are two seperate issuses here,but the republicans want to attach tax breaks for the rich and cut the middle class programs which we paid into,to the debt ceiling.Raise the ceiling so we can pay our bills and then work out balancing the budget. It means possibly one of four things: a majority of people oppose raising the debt ceiling in general, a majority of people oppose the measure without cutting spending, people are generally uneducated on the subject and shy away from any action that would allow "spending" to continue, or a mixture of the three. In any case, there's no clear choice, which explains the difficulty lawmakers are having in resolving this issue. It means that they don't understand what the debt ceiling really is. To those Tea Party supporters who scream about cutting Federal spending- If you don't think we should spend "your" money- we'll start with saving money in the states and districts that elected people like Rand Paul and Michelle Bachmann. How much would be saved if ALL Federal funding was eliminated from Texas, Iowa and Kansas? - No highway funds- no FAA , no farm subsidies. DFW is closed? - too bad, drive to an airport in a state that accepts Federal money (hope those bridges are safe). Most Americans have a very short term memory and would rather be watching dumb television shows and Faux news than watching real news like CNN and other genuine cable news shows. Most Americans don't even know who their representative is and half don't vote. The Gallup organization are very biased as was seen during the previous administration. I don't give Gallup any credibility and neither should you! These self serving politicians(Obama, Pelosi,Reid) have been on a spending spree that would give a drunken sailor a bad name. They just have to roll spending back to historical averages, 18%, and there will be no crisis. That is plenty enough to pay debt obligations, social security, armed forces but most of the worthless fedreral government employees, subsidy riders and others with hands in our pockets will have to make other arrangements. It means that 42& of our citizens are teabaggers/Obama haters and are willing to believe the Republican lies even when commen sense tells them different. Where was the 42% when they raised the debt ceiling during Bush's tenure. Where was the outcry when he squandered the trillions of bucks Bill Clinton left in the treasury? Do these 42% understand that a lot of that debt has to do with the two wars that Obama didn't start but is trying very hard to put an end to. It means that they are ignoring the fact that the Repub lackeys are following orders from their bosses (corporations and Wall Street) to stop Obama from taxing them at all, let alone raise only their taxes. It means that these very same people will be the first ones crying if the Repubs get their way and social benefits are cut or eliminated. These people have to be stupid if they believe that not raising the debt ceiling will not affect them. it's amazing how many brain-dead voters we have in this country. Not only should voters be required to show id when voting, they should also show their psychiatric test results in order to vote. It means that 42% of the American people are woefully misinformed (If not plain stupid) about the implications of the US defaulting on its debt. It means that the GOP can claim a 42% success rate in dumbing down the electorate to the point where they will oppose what is in their, and the country's, best interests. But that's how they've always succeeded. They run on the premise that government does doesn't work. Then, they win and they prove it. I posted about people not understanding the issue before reading others responses. It's even worse than I thought. People seem to think this has something to do with spending. It does not. It has to do with us paying our bills so that we can keep the country running and not cause a world wide economic meltdown. Think things are bad now? You ain't seen nothing yet if we default. It means that both sides of the aisle are so entrenched in making the other side look bad that they no long care about anything except getting their own way. I would hope that along with millions of Americans in danger of not getting their paychecks, that the 500+ members of congress, and the members of the White House involved in this debacle, are also facing not getting their paychecks either. After all, they are the ones who are not doing their jobs. And are Nancy Pelosi and John Boehner going to explain to the creditors of all Americans who are on Social Security and depending on it to live, thats its okay to let us slide on our bills and groceries until the government gets it's act together? Or can we just send our bills directly to Nancy and John and all their pals? And by the way, to all members of congress.....if my social security check doesn't arrive I promise you. I WILL REMEMBER, whether you are running for election in 2012, 2014, or 2016. And I don't care if you are a repulican, tea partier, or a democrat. It means these 42% are expressing understandable concerns and frustration about our fiscal mess, but are woefully uninformed about the consequences of not paying our bills. They do not understand that the consequences of defaulting will so damage our economy and the world economy that getting our finances in shape will be much harder. I get these 42% are frustrated, but I am astounded at their lack of appreciation (or knowledge) of the consequences of not raising our debt ceiling, and I am shocked that 42% of the people in this country appear to be comfortable with the ethics of simply ignoring our legal obligation to pay our debts. Jack, simply stated, don't raise the debt limits means...don't raise the debt limits. Don't is a contraction of "do not", if my grammar school English still holds true, and we still are an English speaking nation...arn't we? (Arn't means...are not)! This percentage is only listening to sound bites. They don't realize that this money has ALREADY BEEN SPENT. Its a bill that is due, just like their rent. And if we don't pay our debts, just like your if you don't pay your rent, we get evicted. The debt ceiling limit and all the other issues such as deficit reduction, taxes, etc., are separate issues. It is ridiculous for this to be a political football, and one that has taken decades to create. It just has to be done so we can stay afloat. In fact, it should be done by executive order, as the constitution allows for. Quite awhile ago an important fellow said " Washington doesn't have an income problem, they have a spending problem"...and they have only made it worse since he said that. Both parties cannot stop acting like kids in a candy store, they keep giving away money to – special interests, businesses, people that "help" them, foreign countries that do not like us, and on and on and on. The only way to stop them is to force it. Best bet would be a balanced budget amendment, but they probably wouldn't pass that – would take away their ability to influence the country's direction. So instead we say...Do NOT Raise The Debt Ceiling. A lot of people, including you say that would create a catastrophe...well it didn't in the past when the debt went over the ceiling. The government has a lot of money coming in every day, they would just have to prioritize what they spend it on until they get spending under control. I really believe that asking this administration to control spending is a foolish wish..something drastic has to happen to make it happen. Our brutally tactful government spends 90% of it's time posturing for an argument and 10% arguing. We want policymakers who have the foresight to develop effective laws and programs with responsible funding. Who in private enterprise would pay employees for this kind of performance? Raising the debt ceiling ignores the behavior that brought us to this point and continues to allow it. It means 42% of Americans don't know what this really means. If we do not raise the debt ceiling and we do go into default our economy will probably end up in the toliet. Then the same 42% will be the ones crying the loudest. It means that they don't understand the debt ceiling, and if so they shouldn't be voting or even have an opinion on the issue. Apparently that 42% does not have a clue about the ramifications of not raising the limit. Granted the over spending is out of hand and needs to be addresed. The time now is to pass a raise in the limit. Then come back and crunch the budget deeply. If that means raising taxes along with major cuts, so be it. We have to get this under control. Or we lose it all. The representitves in Congress don't like the President. Live with it, he was elected. Change it in 2012. Right now stop holding our future hostage with this bickering. Jack. It means 42% of Americans are 1 GW term too late and many dollars short! Had we not wasted a gazillion dollars and many lives on an unjustified Iraq war, we'd not be in as much a mess as we are today. There's no question we need to stop spending as much money, but remember, Clinton had the check books pretty much in order when he left the office. All hell broke loose after that! People must not understand that it's much easier to get into trouble than it is to get out. It took years for us to develop into this and many other problems that we are all expecting a 2 year now president to have all the fixes for in place. Look at the recent Wall Street Journal story on how tax breaks have NOT historically helped our country. Look how now nearly 10 years of them haven't either. Obama compromised with the Republican's on preserving these breaks, but there is no sign that they are working and now when he wants to really get something done, the Republican's are doing nothing other than making sure the jobs aren't there through the elections so they can get all the votes! When Boehner tweeted the question to Obama, "Where are the jobs?," Obama should have replied, "Where are the job bills?" The Republicans have control of that now and haven't done one damned thing about it. 42% of America needs to wake up and smell the reality of politics at play. The ceiling needs to be raised because there's no other economical 11th hour alternative and Americans need to put the right politicians, Republican, Democratic or Independent into place to forge real cost cutting plans. We need to stop blaming President Obama for all the issues we're dealing with today and think about what we did in the past that allowed these issues to come about so we don't repeat them again! It means that Americans prefer to raise taxes (more revenue) now rather than borrowing money (more debt). I absolutely agree, because our wealthy upper class Americans can afford it and are willing to pay more taxes to save the American Dream, which benefits all of us. Raising taxes (more revenue) will also enable us to pay down the debt (less debt). We did it in the 90's, let's do it again! It means that the 42 percent have no concept of the way our world works. if we do not raisse the debt ceiling, all of our baby boomer parents and grandparents, some of which who solely rely on their social security to live, would be forced to go without the means or the medication for the basics they need to live. they wouldnt be able to spend money, which would hurt our economy even more. our middle class is obselete. and if they debt ceiling is not raised, im afraid the middle class will be all but non-existent. i agree, with our president, that the rich should be taxed. the billions of dollars in profit that our corporate c.e.o.s are making is going straight into their pockets and not going to producing jobs like it should. ameriicans took a stand when we voted for change with Obama. we need to take a stand again and show the republicans, and other lunatics like Michelle Bauchman that enough is enough. a revolUtion is coming. It means that they know that they cant keep on spending and Borrowing. It has to end, and the time is NOW! We will not let their scare tactics rule over our better sense. Repeal Obama Care; Do not raise the debt limit. GOD Bless the U S A ! It means that the conservative main stream media has brainwashed them into thinking that cutting spending is the only important thing. Any journalist who screams, "cut spending, cut spending" and doesn't mention "raise revenues" is an obvious Republican. It means that the 42% only represent those people who were actually polled. It does not represent 42% of the entire 308 million American citizens. I wish you would please make that abundantly clear to your listeners. By the way, no one polled me. Why don't the American people tell Congress (both sides) that if they can't reach a compromise, then they should all tender their resignations. What do you think about that? It means that there are a lot of people that are drinking the tea-party kool-aid. The Democrats have worked at cutting spending but they are also wanting to balance that with closing loopholes for the corporations raking in billions in profits. The Republicans keep saying that will hurt job creation if they have to give up some of those profits. I suggest it would help job creation if they have to spend some of those profits on salaries for new employees, raising the stagnant salaries of their current employees, and investing in newer equipment that would help stem some of their pollution and high energy usage or pay higher taxes on those profits. If they can keep all of those profits without having to worry about being in a higher tax bracket, why should they "spread the wealth"? I saw no poll figures on how many people wanted to see loopholes closed? I think, Mr. Cafferty, that you are presenting a very slanted view on what and how the American people think. Jack, it just confirms the failure of our educational system and the effectiveness of the right wing propaganda machine. As I tell my friends, there are idiots out there; they drive, they vote and they watch that "F" word network. Unfortunately, I do not think that most Americans understand the gravity of the situation if we default. Many Americans cannot tell you who bombed Pearl Harbor let alone the intricate details of the importance of U.S. Treasuries in world economics. As a lifelong Republican, I am disappointed at the state of the GOP. They more resemble the Hells Angels then they do a serious political party who is willing to work within the framework of compromise that is the basis of our Constitution to reach decisions that represent all Americans. Although there is plenty of blame to go around, I believe that our President is trying to do his best to bring Congress together to find a solution. What it means that 42% of Americans don’t want to raise the debt ceiling. It means that 42% of Americans just listen to what others say than educate themselves. I mean can 42% of not pay their bills and expect nothing to result from them not paying their bills, of course not. Yes spending needs to get under control it needs to start with both parties, stop trying to please whoever supports them and just do what's best for all Americans. This republican and democrat line drawn in the sand is childish and should not be tolerated. I am a conservative and I can tell you if my party thinks they can sit there and just protect the a few in the rich. Not taking care of the base of the party, which is not the rich, but the everyday conservative. Then they are greatly mistaken. Regular conservatives not the ones with lot of money the everyday guy. We are fed up and I am not the only one, if this debt thing isn't solved in time with a real solution. I personally along with other conservatives will rally against anyone involved in this failure. We will protect of nation against all enemies both foreign and domestic. Because the real problem, the real enemy here won’t be the past mistakes it will be the congress controlled by my party, who still wants to play protect the rich. The rich are not the only one that got them in office. They Have the money to survive comfortably in these hard times and the average Joe does not.